NOTE: RATES INCLUDE CLEANING AND TAXES. BE SURE YOU ARE COMPARING APPLES TO APPLES WHEN COMPARING WITH OTHER CONDOS. DATES CITED ABOVE ARE ARRIVING AND DEPARTIMNG. Great location, convenient to all Summit County ski areas in winter and to Lake Dillon in summer. Free Wi-Fi. Great layout for groups--large living room/kitchen and split bathrooms (vanity and sink outside bathroom with toilet, tub, and shower). See photos at bottom of listing. SORRY, NO PETS, AND NO SMOKING INSIDE THE UNIT (PATIO O.K). Condo has three bedrooms, two full baths, each with a separate wash area. 1100 square feet. Great location in Dillon/Silverthorne area of Summit County, 12 minutes from Keystone, 20 minutes from Copper Mountain, 25 minutes from Breckenridge, 35 minutes from Vail. Factory Outlet Stores are just five minutes away for a break. Completely and warmly furnished and meticulously maintained (its our vacation home, too). Sleeps 8 in several bed combinations. Two bedrooms with queen-size beds, third bedroom has two single beds (extra length). Queen-size sleep sofa in living room. Master bedroom and bathroom/wash area separated from other bedrooms by hallway which can be closed off with a curtain door. Wood burning fireplace. Large 55 inch flat screen 'smart' TV in living room accesses internet and downloads movies from your Netflix or other similar account. Owner can tell you where to rent skis, boots, and poles for $17/day. Completely furnished kitchen includes large microwave, complete line of cooking utensils, dishwasher, bagel toaster, coffee bean grinder, even condiments! Nearby clubhouse facility has large heated swimming pool, hot tub, saunas, pool tables, laundry facility, tennis court, basketball court, and children's playground. Retired in Colorado. Bought a condo as a 2nd home. Furnished it fully--down to the coffee bean grinder and the crock pot. Dillon Valley East is centrally located to 4 world class ski areas; but it is near a real town with lots of amenities and features and realistic prices. The condo complex has lots of room--both in the condo and on the surrounding grounds. It also has a very large indoor heated pool and adjacent 12 person hot tub. Units are well heated and have good views of the surrounding mountains. Bathrooms are 'split', i.e. toilet and tub/shower in the main part of the bathroom and a sink/vanity adjacent, just outside the door. 'L' shaped eating bar with 6 arm stools separates the kitchen from the living room. Accessible in spring, summer, and fall from adjacent parking lot across 50 ft. of grass and through my unit's patio gate and door. It was a nice condo, good unit, good parking, good location. Extremely comfortable and well stocked property. Easy to feel right at home. Very Clean and spacious. Easy access to all ski resorts. Plenty of dining options. Ed was a perfect host and communicator. Easy check in and out. Would stay here again. Wish the hot tub was more accessible- we were unable to use . The hours for clubhouse usage are too restrictive but still a great way to spend time with family and Be In the mountains . I've been stating in this unit for several years, and plan on continuing to stay there during the winter. The owner is extremely responsive, attentive and knowledgeable about maintaining his property. It's full of amenities, such as cookware, a fireplace, patio and grill, so you can live like you're at home. If you're coming to ski or snowboard, the location is excellent. It's easy to access all of summit county and beyond from here- Keystone, Breckenridge, Copper, Vail, Beaver Creek and Arapahoe Basin are all short drives. I've even found Steamboat to be a reasonable day trip from here with a drive of about an hour and a half. Dillon is also a great little mountain town with lots of good dining options. The location was perfect. Condo was well stocked, clean and quiet. Thanks to the owners for a wonderful place. My husband and I decided to get away from the heat and humidity in northern Illinois and spend four weeks in Summit County this summer. Fortunately, we found Ed Lee's condo in Dillon CO. This three bedroom, two bath condo has a nice floor plan to accommodate overnight visitors and a very well appointed kitchen with all the conveniences. We especially enjoyed the comfy couches. 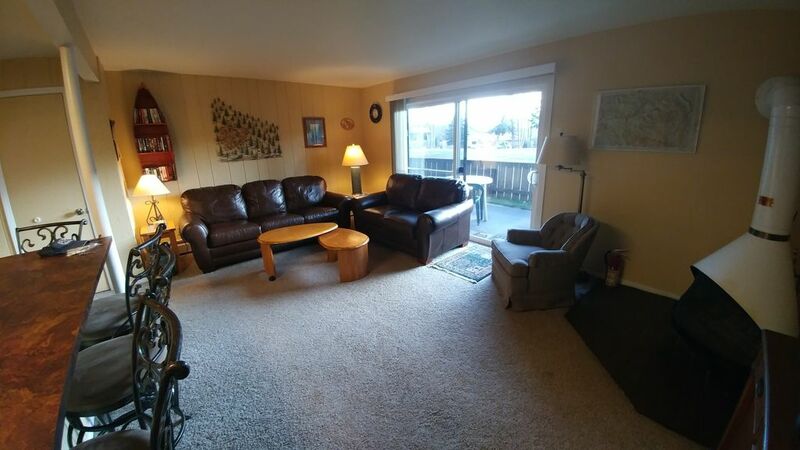 This condo is on the bottom floor and has a fenced patio large enough to store our two kayaks and bicycles. The condo is close to Lake Dillon, the Dillon Amphitheatre, the seasonal Farmers' Market, restaurants and shopping. (My favorite restaurants are Sunshine Cafe, the Dam Brewery and Araphoe Cafe.) We learned to use the Summit Stage bus that offers free transportation throughout the county and to many of the area's towns and resorts. We would put our bikes on the bus bike rake and travel to our destination to avoid riding/walking the bikes up the long hill to highway six. Riding downhill was great! Ed is very organized, detailed and easy to work with. We would definitely recommend this condo to friends and family and hope to make it back to Dillon in the future. We enjoyed our stay very much. Everything we needed was available to us. It was very accommodating for a large family gathering. Very nice facility and kept exceptionally clean. 1. Summer rentals must start or end on a Saturday or Sunday 2. Monthly rates are based on 4 weeks starting and ending on a Saturday or a Sunday 3. 2018-19 Season Rate shown With 2-Week Break at Christmas/New Years, which owner rents out separately in one week blocks (6 nts minimum). To Rent For Entire Winter Season Including Christmas/New Years Add $2,000. ADDITIONAL NOTES: 1. RATES INCLUDE CLEANING and TAXES. A $200 damage deposit is due upon booking, and is fully refundable after your damage-free stay. 2. Bookings must normally begin or end on a Saturday or Sunday 3. Monthly rate based on a 4 week stay 4. Will Pro-rate Weekly Rate For 5 or 6 day stays in Spring, Summer, and Fall.